Yes, it&#8217;s upon us once again. The celebration of horror and the frenzy of fear. Halloween is the time of the year where you can look good by actually looking bad. You can let loose on your style but still dress to impress. When it comes to your Halloween hairstyle, the crazier the better. 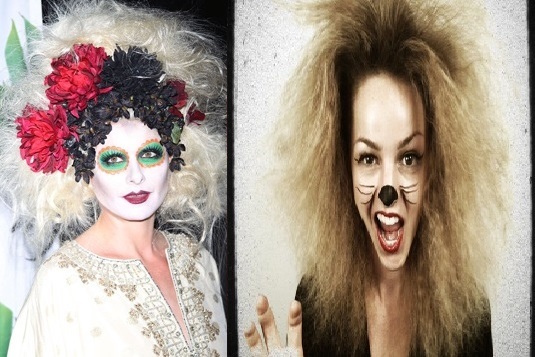 From big frizzy hair to sleek up-styles, there are plenty of hairstyles to try out this Halloween. Whether you&#8217;re dressing up as a zombie or a wrecking ball, these Halloween hairstyles will get you set up for the big night. This is a look that you normally wouldn;t be caught dead with. However, it is Halloween and the look of death is a common feature. Some of you may wake up in the morning looking like this and therefore dont need to put any work in. For those of us who arent so lucky (thank god), the best advice would be a mix of a blowdry, a hairbrush and of course some hairspray for volume. 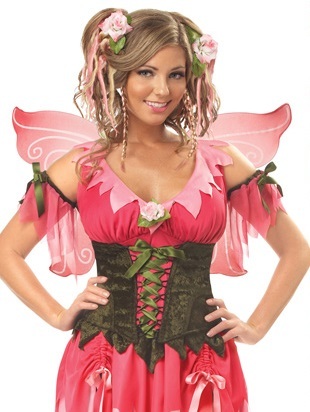 If you want a look that wont scare the kids, then try out the Fairy Princess. Youll want to have your hair looking its best for this though so a recent trip to the salon is advised. The look in the picture will require slightly shorter hair but long hair is also feasible. Start off with having your hair straightened. Move on to a bun and plait either side of the head, tie together with a ribbon or flower of your choice and youre flying (pardon the pun). This style is for those of you who want to look scary but chic. We call it. wait for it.. Scary Chic. Okay, okay, not the most original but at least it rolls off the tongue. It comes with a mix of devilishness and sexiness. Looks great on darker hair as it really brings out the red highlights. If you&#8217;re a blonde then a similar streak of black highlights works as well. Get ready to rock the night and slay those vampires. It&#8217;s certainly a popular look so we said we’d add it in. If youre planning to turn up to the Halloween party as a ballerina or even a cast member of Downton Abbey, the ballerina bun will be a main feature. An up-style will do the job very well especially as it will stay in place through all that dancing, treating and tricking. On the flip side you could always try a clip in Hair Flash attached with discreet wire placed behind your hairline covered with your own hair, The flashes can then be positioned wherever you want. From her backcombed Debut to scrunched Like a Virgin, she even went short and platinum True Blue to Who’s That Girl, she even went back to her dark roots for Like A Prayer, [quote_right]Madonna immaculately changed her look. [/quote_right] Madonna even went Erotica with the sleek style and had a Bedtime Story with platinum blonde, she’s done it all. Madonna had Something to Remember with classic 30’s 40’s look with Evita, and went all natural and wavy for Ray of Light. She had a cowgirl moment with wavy glossy curls with Music in mind, but then she remembered her American Life roots and went dark brown again with a choppy more edgy look. Then Madonna had some Confessions on a Dancefloor with red auburn glossy locks, then she went all Hard Candy back to her signature blonde and Back to natural MDNA blonde with natural shiny waves. Pamela hasn’t cut her hair for over 18 years! 24 Oct Do Fringes Suit Everybody? It feels like every 5 minutes! Are They In? Are They Out? Great for hiding forehead wrinkles (cheaper than Botox) Ha! However they don’t suit everybody and different growth patterns in the hair can mean the fringe maybe more work than anticipated. Now that we are all feeling like drowned rats! Well in the UK any way ,I thought now might be a good time to recommend some Anti Frizz Products since the weather has made our hair flyaway and frizzy…. These products are fragrance infused and contain argon oil and other essential oils, they absorb into the hair leaving it felling protected smooth silky and weightless, unlike a lot of serums they do not leave the hair feeling oily, I use this product on myself and my clients, there is a product in this range for every hair type. Apply a few drops to washed towel dried hair before styling, an added tip is while you are blow drying always point the nozzle of the dryer towards the ends of the hair this smooth’s the outer cuticle of the hair and eliminates frizz. On a day you don’t wash your hair a few drops of serum throughout the mid lengths and ends will tame fly away hair. Skye Norman Hair & Beauty’s photo. *Offer valid until 25th September 2012, discount redeemable by presenting text message. An ancient massage technique from Japan using tools that look like wooden drumsticks. They’re tapped on the back, and are apparently great for getting rid of tension and boosting circulation. While my colour was processing I relaxed in the chair and the therapist gently tap-danced the sticks all around my upper back and shoulder area for about 15mins. It felt fantastic. It was different from other massages because I could feel the vibrations throughout my body as I was tapped. I did. I didn’t fall asleep, when I opened my eyes I felt totally calm. My back felt amazing. It made me realise how much tension I’d been holding in. I felt really relaxed, invigorated and re-energised. I’ll definitely be going back for the treatment again. A passionate Beauty Therapist and Make-Up Artist With over 8 years experience Michaela is quickly establishing herself as one of the finest international Beauty Therapist in London. Winner of World of Beauty & Spa Award Prague Michaela uses only the highest quality products which are tailored to each client’s specific needs, with obsession and perfection she has produced fantastic make-up work within photography world and real life. Grab all the Beauty hints and tips from our in-salon Professional MakeUp Artist, whether it’s Bridal Make up or just a Special Occasion Michaela will guide you through to discovering your perfect look. Within the salon we offer a full range of Luxurious Treatments by Kerastase, Seibelle and Schwarzkopf hair rituals they are prescribed to treat your specific needs. This indulgent therapy can take from 5-20 minutes depending on the current condition of the hair. From the moment it is applied it starts to work instantly! The treatment is smoothed onto the hair in sections whilst the scalp is being massaged. We offer Scalp, Indian Head Massage plus a specialised neck and shoulder massage, a hot towel is then used to allow the treatment fully absorb into the hair. The result is you being left feeling relaxed, revitalised and the hair enriched with protein, moisture and full of shine. We are blessed that our Salon is Located on famous Old Church Street in Chelsea minutes walk from the beautiful Old Church which over looks the River Thames our dedicated Team have long serving experience in Special Occasion Hair, We are perfectly suited to take on the challenge of a big wedding day, with our knowledge and expertise we offer a Complimentary Consultation to design a unique personal service with advice on the must-have Wedding Hair, with ideas to achieve the best look that suits your accessories, Hair Maintenance and a wealth of wedding Makeup & Beauty advice from our Beauty Therapist. Our Wedding Packages will take the fear out of worrying and will leave you looking fantastic your important day.